Edmonton – Loma House – Road Trip 2014 – vegan in your city. I’m now a year behind on these posts about our 2014 road trip across North America, but I’m going to keep chugging along. They’re stories I want to tell, there are pictures I want to share, and they are memories I want to remember later. You can see some of the past & present posts on this lovely map on Pinterest. On one of our last few days we went over to Loma House – primarily because they were open on a Monday, unlike nearly everyone else, and I’ve heard good things from local vegos online. We were hoping to check out Padmanadi on this visit, but sadly it just didn’t happen. 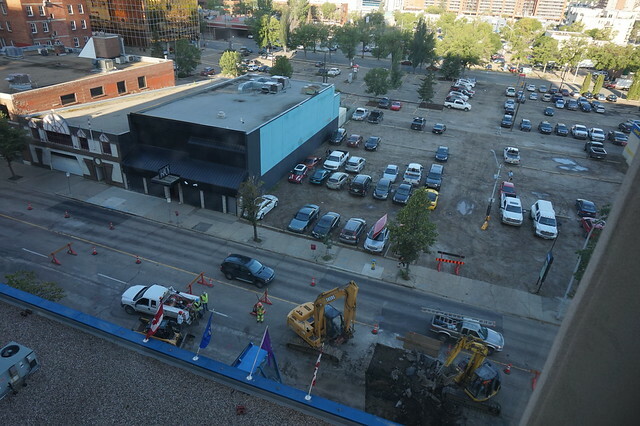 I didn’t particularly enjoy the experience, and so I have been avoiding writing about it – but that morning we were woken up with the sounds of jackhammers outside of our downtown hotel at 7am. So the mood surrounding the visit wasn’t high, and there are some negative factors with my experience and my day. I also don’t do particularly well with heat, and it was around 30. So, take my thoughts with a grain of salt. That said, service was friendly, JC’s meal looked pretty good. I ordered a big bowl of Hot and Sour soup, which was okay, but not what I was looking for. 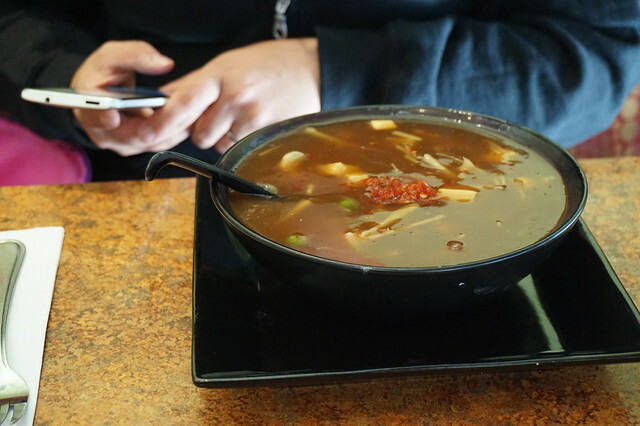 On a normal day – I probably would have loved this bowl of soup, though I found it a touch too sour, and not spicy enough (but that’s normal), and not salty. But I did like most of the stuff in it. The thick broth had diced tofu, bamboo shoots, mushrooms, carrots, and peas in it. I threw in a bunch more chili oil, and that solved most of my tastebud issues. The soup was big, it was warm, it was sour. 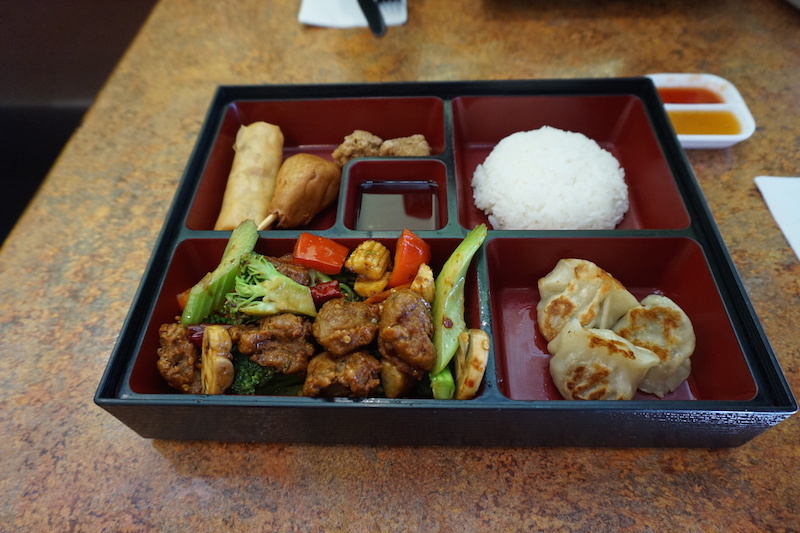 But then – JC’s Bento Box came out and I felt like I had made a bad call. If I ever find myself at Loma House in the future – I’m going to get one of these boxes, because from the various bites I stole from his plate, it was great. Especially the broccoli and the dumplings. The next day our Carmobile was scheduled for its first oil change (as we had managed to hit over 8000km by then, half of which was accomplished during our road trip up until that point.) We would be leaving immediately afterward the car was tuned up to drive south to Drumheller, and then finally ending the night in Calgary. We ate at Cora’s with my parents that morning, conveniently, it’s a restaurant that was close to the dealership AND a spot with a breakfast option I actually really like. You wouldn’t necessarily expect a chain to have such a solid raw-veg option, but I’m always pretty excited about the Samira’s Wake Up fruit plate (and so is my mom.) It also comes with toast if you want it – with all the peanut butter you can eat. 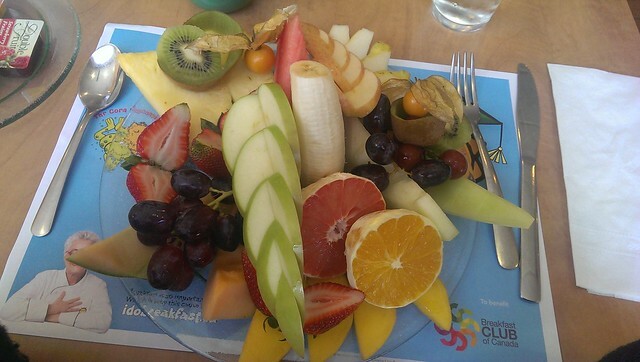 So you end up with a really nice fun plate of assorted fruits that actually satisfies. So next stop – Drumheller! Cora's Breakfast, Loma House, Roadtrip2014, Vegan Edmonton. Bookmark.